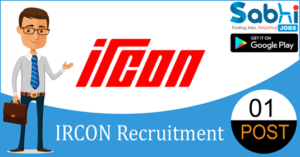 IRCON recruitment 2018-19 notification has been released on official website www.ircon.org for the recruitment of 1 vacancies at Ircon International Limited. The candidate who is looking for Safety, Health & Environment Director can apply offline application on or before 02nd August 2018. Qualification PG Degree/ PG Diploma in Environmental Engineering /Science/ Industrial Safety & Environmental Management or M.E. in Industrial Safety or BE in Fire & Safety Engg. with advanced Safety Management Diploma or B.Arch/ B.Tech or Full-time Degree/ Diploma in Safety. How to Apply Interested and eligible candidates may submit their prescribed application form with all relevant certificates and testimonials to DGM/HRM Ircon International Ltd., C-4, District Centre, Saket New Delhi- 110017 on or before 02nd August 2018 and also appear for interview along with all original documents on 07th August 2018.